I’ve always really liked our Soldier Emperor game, and now that this game finally has a graphic treatment worthy of its game play, I think you will too. Here’s a look at why. Soldier Emperor uses the same game engine as Soldier Kings, but is a much different game. Where Soldier Kings looks at the world-wide conflict of the Seven Years’ War, Soldier Emperor is focused solely on Europe and the nearby parts of North Africa and the Middle East. Its sister game, Indian Empires, expands play into India and the upcoming Dreams of Empire boxed expansion set links the two with a map of Persia and Central Asia. We intended Soldier Emperor to be a beautiful game, and it is. The ultra-thick playing pieces each sport an original painting by Terry Strickland. The map is also an original painting and a joy to play upon. For the upgraded edition we've added real, full-sized poker-style playing cards (prior editions had small perforated cards); they're on very nice stock with rounded corners and are the nicest cards we've ever produced (not that we've produced many). None of that's really necessary for game play - it still plays the same - but it definitely enhances the experience. The game engine itself is pretty simple: leaders move fleets and armies, engage in battle (straightforward “roll a 6 to hit” combat), and lay siege to enemy territories. A better leader will help his armies or fleets move and fight better, and Napoleon has special powers. The game’s nuances lie in all the things that allow the armies and fleets to operate, chiefly, economics and diplomacy. The game plays fine with two players, but really shines with the full seven. There are no neutral powers: there are only enemies you have not yet attacked or who have not yet attacked you. Your allies are staunch friends … until they’re not. Card play drives the game. You can play cards at any time (there’s a countdown at the start to make sure everyone has a chance to look at their hand first), and many of them will unravel your carefully-laid plans. But this is not what some would call a “card-driven game” – you could throw out the cards and the game could still be played. It would be a lot less fun, but the game engine would still work after a fashion. What all that gives you is a strategic game of the Napoleonic Wars that can be played to completion in a reasonable length of time (probably eight hours for the full 1803-1815 campaign game, but realistically that’s going to vary wildly based on a group’s level of diplomacy and table talk – this is a game that generates a great deal of chatter). The Second Edition rulebook is a the result of years of play and feedback, and about as solid as game rulebooks get – you won’t have to wait for some Swedish volunteer to write a new one for you to get playing with your friends. In fact, you can download the Second Edition rules right here. 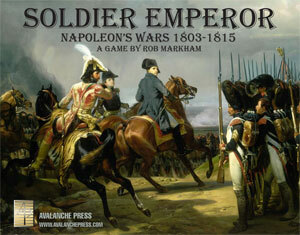 Soldier Emperor has twelve scenarios, covering all of the Napoleonic Wars from the Corsican’s coronation in 1803 to his last hurrah at Waterloo in 1815. Ten of them are of relatively short duration, usually lasting from eight to twelve turns (the Hundred Days scenario lasts only four). The other two are campaign scenarios, with one starting in 1803 and lasting through 1815 (unless someone wins the game before then) and the other running from 1812 through 1815.